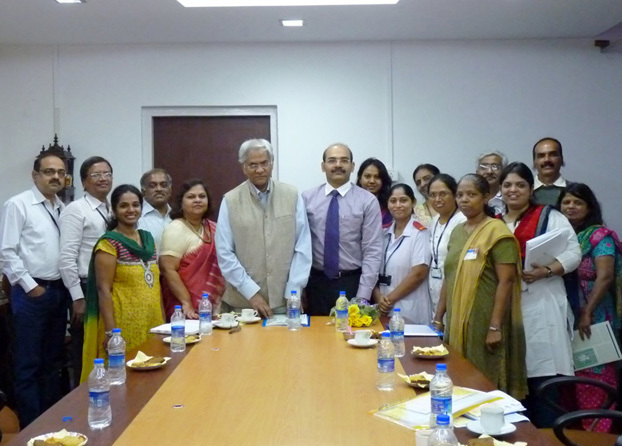 Shri Keshav Desiraju, Secretary, Union Health Ministry, visited Dilaasa, a joint initiative of CEHAT and the Municipal Corporation of Mumbai on 15th January 2014. He met the counsellor at the crisis centre where the crisis intervention model with its emphasis on safety assessment and safety plan, was presented, the pathways for survivors to the crisis centre from within and outside hospital and the documentation of the interventions were discussed. He reviewed the records and asked questions about the assessments and follow up. He then visited the OPD departments of the hospital and the DOTS clinic before a formal presentation about the Dilaasa centre and interaction with trained doctors and nurses. This interaction focused on how Dilaasa has been set up as an integrated model for responding to Gender based violence (GBV) which includes domestic violence, child sexual abuse and sexual violence. It has institutionalized gender based violence as a legitimate and critical public health issue, in the health system and built capacity of health care providers to recognize and respond to the issue sensitively. Initially, several problems were observed in the attitudes of staff towards the issue of violence against women, the apathy in recording medicolegal cases, non-recognition of obvious signs of abuse (attempted suicides, burns, assaults, falls) and ultimately neglect of the root causes of injury and ill-health among women patients. Intensive training of staff on the issue was undertaken which showed that they could identify women facing violence within two years of onset of abuse, as most women coming to the hospitals were young women in child bearing age group. The crisis centre was located in the social work department, rather than the psychiatry or other departments, as it is independent and also prevents medicalization of the issue. Location in public hospital makes it available to women of all communities and is accessible. Several health complaints that are indicative of abuse can be screened at the health system and women are also more comfortable accessing services at a hospital rather than elsewhere. A large number of women coming to Dilaasa have also faced violence during pregnancy, and this makes a case for screening women in the ANC for violence. Further, a sensitive contact with health professionals has shown to aid the healing process for survivors of violence. Survivors’ own perspectives about the centre show that the counselling provided here was able to remove self-blame, equip them to resist and stop violence and improve overall well-being. Dilaasa offers a model that has worked over the years and should be upscaled under the NUHM in all mega cities and other urban hospitals. Such centres must be set up in other hospitals of the BMC. Social workers in these hospitals should be trained to provide services. The community health workers under the NUHM should be trained to educate communities about gender based violence and refer women to the crisis centres. Recognising the key role that nurses can play in responding to GBV, he said that training on GBV must be included in the ANM and GNM teaching courses as nurses are key in identifying violence and providing basic care and support. The national protocols and guidelines for responding to sexual violence that have been formulated by the MoHFW should be implemented in all hospitals in Maharashtra and other such centres set up under NUHM.